Popular delivery apps Postmates and DoorDash have announced a partnership with automated robot startup Starship Technologies, which will see a fleet of self-driving robots make courier deliveries for Postmates in Washington D.C., and food deliveries for DoorDash in Redwood City, California (via TechCrunch). 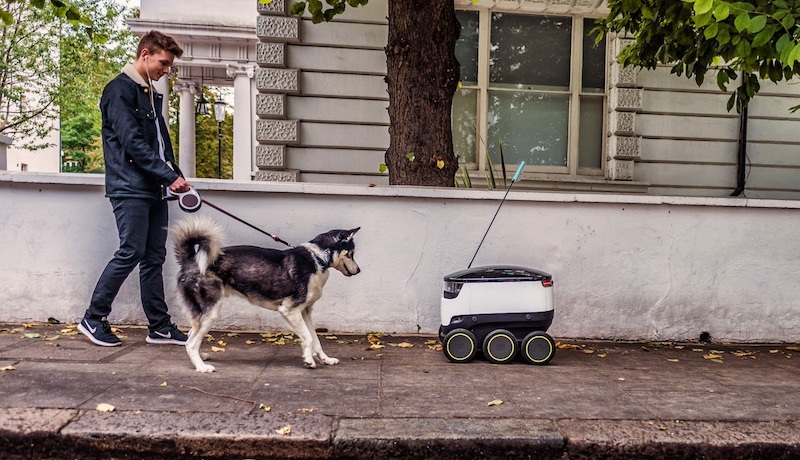 The robots built by Starship are designed to travel among people walking on the sidewalk and can achieve a max speed of 4 mph while carrying up to 40 lbs, all within a delivery radius of 2 miles. The personal couriers are powered by rechargeable lithium ion batteries to ensure that they are quiet when running. Although "they primarily rely on computer vision and street map data to navigate," the robots aren't entirely self-operating as they require a human overseer to manage the fleet through an app. 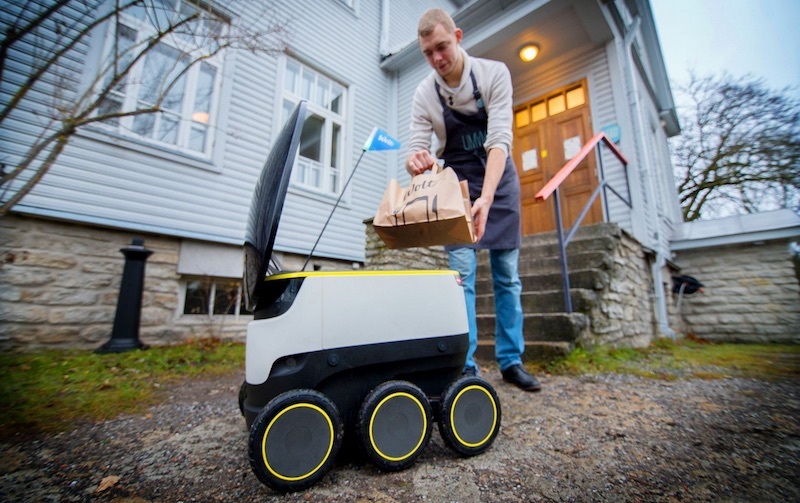 Postmates and DoorDash aren't the first clients of Starship, with overseas companies like Just Eat, Hermes Parcel Delivery, Media Markt, Swiss Post and Wolt previously supporting the robotic fleet of personal couriers. In total, Starship says at least 1.7 million people in 16 countries and 56 cities have been in contact with one of its robots. DoorDash co-founder Stanley Tang made sure to state that the addition of Starship's technology doesn't mean the company is seeking to completely replace its human workers. Instead, Tang has a vision to use the robots as a way for its human workers to avoid small deliveries, and subsequently small tips, because the app tips workers based on the total cost of the order they deliver. His ultimate goal is to "use robots to alleviate “dashers” of the deliveries they don’t want to do anyway." With DoorDash, Starship is expected to be integrated into the app from as early as the ordering stage: users will have to choose to have their order delivered by a robot instead of a human, and then they will receive a text message when the courier arrives at the door. Thanks to Starship's security measures, the robot's compartment will be calibrated to be opened through a link in the text message that the user receives, so no one else can take their food order. Automation in technology has been surging as a popular topic in recent years, from Amazon's successful first drone delivery with Prime Air last month to Apple's confirmation of its interest in a self-driving vehicle system. Companies like Uber and Google have expressed interest in self-driving cars as well, but recently began scaling back their ambitions due to trouble with automotive legislation. Those look ridiculously easy to steal. One step closer to a massive layoff of delivery workers. LOL, agreed. not much worth within BUT it would surely cost the company a LOT more than an employee: robot insurance spike if a numerous amount is stolen. Implementing tracking and camera's would also increase per unit cost. Yeah I get teh same raw deal with Taxi delivery here in Toronto. 3 buildings, only 3 on my street right next to one another and the drivers cannot figure out which address belongs to which at the side of the road. Moreover they don't bother reading the building number painted on the main front building entrance door with 75 Size font. lol. Based on the potentials and caveats above I think this would only serve to bolster employment and sustainability of delivery workers.